The potential impacts of Plan S (a funder led plan to accelerate a global flip to open access to research publications) on the wider research ecosystem are only beginning to be understood. Citing evidence from a recent report by the Institute for Scientific Information on Plan S funded research papers, Dr Martin Szomszor, outlines what the impact of the plan might be on four key aspects of scholarly communication. For those examining the landscape of global research funding, we live in uncertain times. While it is true historically that changes in governments and policy have presented a range of opportunities and challenges for institutions and academics, the last couple of years have seen seismic changes. In Europe especially, the potential effects of Brexit have been well-discussed, but are still not known; and more recently, a transformative change has emerged in the form of Plan S.
Launched on 4 September 2018 by Science Europe, Plan S is a proposal to require researchers that benefit from state funding to publish in open repositories or in journals where all papers are publicly accessible, usually made possible via payment of Article Processing Charges (APCs). The ultimate aim is to ensure all publicly funded research is freely accessible to anyone with an internet connection. The plan moves the cost of publishing from the reader or their library, typically via a subscription charge, to an obligation on the author (via their institution or funding body) to pay via an APC. Initial responses to Plan S took the form of open letters, consultation responses and media interviews. Academic advocates point to Open Access (OA) benefits, while the more cautious point to the benefits of an established publishing structure, highlighting concerns about the imposed choice of publishing venue, the cost of Gold OA and the lack of distinction between subject areas, for example. Institutions broadly agreed with Plan S’s overall goals but had concerns over the proposed timeline. Our report, “The Plan S footprint: Implications for the scholarly publishing landscape” seeks to inform this debate by looking at recent patterns of publications funded by Plan S supporters. These make up only 6.4% of papers indexed in the Web of Science, but they are well-cited, published in high impact journals and often, in journals from major publishing houses. The report uses perspectives related to funders, subjects, countries, publishers, and journals. It offers a data-driven perspective, based on 1.9 million papers published in 2017 from over 20,000 journals in the Web of Science Core Collection and raises several questions for consideration by the research community. Firstly: Some research areas have very few journals that are currently Plan S compliant. Without carefully paced transition to allow for the emergence of new titles, we have to ask, is there a risk of unusual constraints and disjunctions in publishing opportunities in affected subjects? The papers funded by Plan S supporters that are not currently published in DOAJ-listed journals might be described as ‘papers at risk.’ Areas such as Mathematics or Chemistry will likely find Plan S particularly challenging, whereas areas such as Immunology and Molecular Biology & Genetics have much greater compliance. The Social Sciences have lower levels of compliance, but also lower levels of funding from Plan S supporters, so are not seen to be at risk in the same way. Ultimately, a shift to wholesale open access will only be possible if authors are willing to publish in the open access journals available in their field. Our report also shows that in 2017, Plan S funded papers were cited more on average than other papers – and this is true in all research areas. The disparity of citation impact between Plan S funded outputs and others is likely to be a factor in the subsequent reshaping of the publishing landscape. Citations are not a defining metric of quality, but might the restructuring of the spread of well-cited papers have unplanned contingent consequences? Plan S funded papers include many authors who publish in leading subscription journals and in many hybrid journals. Not all such authors are in countries endorsing Plan S. Some are G20 countries; many are in the Global South. Which begs the question, how can the shift to Gold Open Access and associated APCs be managed equitably to protect the positions both of unfunded researchers in G20 economies and of a wider spread of authors in emergent research regions, especially given the collaborative nature of academia? Lastly: the large publishers, with a diverse stable of titles, will be influential in discussions but there are many small publishers, including those linked to learned societies, who publish an important part of the Plan S funded output in serials central to their discipline. Will transition be more difficult for them and, if so, can this be managed effectively but flexibly? There is no doubt that Plan S presents a radical shift in how research will be funded and will require careful thought from those who must create new guidelines, shift business models, or consider which journal to submit their research to. No-one knows exactly how it will play out, and the likely path continues to evolve. But, if implemented carefully, it could be a rare opportunity to bring whole-scale change and benefit society through increased open access to publicly funded research. 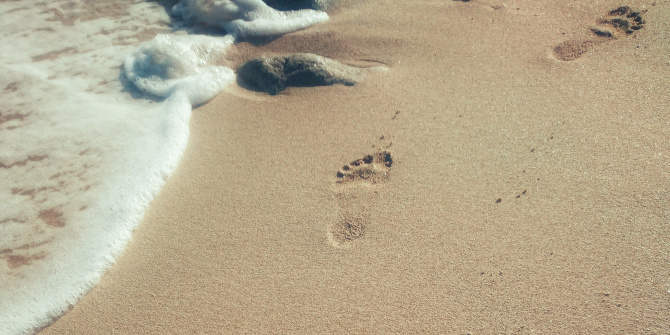 This blog summarises a selection of findings from The Plan S footprint: Implications for the scholarly publishing landscape, published by the Institute for Scientific Information. Image Credit: AbdolAzim Mollaie via Unsplash (licensed under a CC0 1.0 license). Dr Martin Szomszor is Head of Research Analytics at the Institute for Scientific Information, part of the Web of Science Group. He was named a 2015 top- 50 UK Information Age data leader for his work with the Higher Education Funding Council for England (HEFCE) to create the REF2014 Impact Case Studies Database.